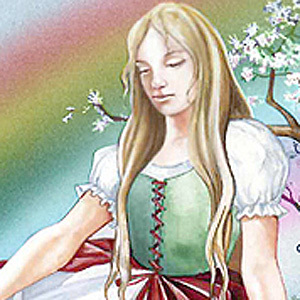 This piece of art is “The Rainbow Maiden” and was created roughly around the same time as Jasmine. Upon the waning of the Third Age of the Mid-Realm, there lived a King who ruled the great peninsula of UR. The wise rule of Arbethe* and the prosperity of UR was widely known throughout the Mid-Realm. And many traveled South to partake of UR’s hospitality. King Aranbrod’s* greatest love was for his pale and fragile queen who died while delivering unto him a daughter. And although King Aranbrod grieved over the loss of his beloved wife, he took steps to insure his only child would be strong in body and mind. As his daughter’s blonde hair shone golden in the sunlight, he called her Flavia,** which means “golden hair.” As the years passed, he marveled at how well Flavia resembled her mother. Because he forgave her mischief far too often, Flavia grew to be headstrong. Reluctantly, the king granted her wish. Thus, year after year, Flavia was able to put him off until her 15th birthday, when it was clear for all to see that she had grown into a fair and beautiful young maiden. To her father’s satisfaction, Flavia finally agreed to be wooed by the many eligible suitors of UR. But her condition was that she be the only one to decide who would be her husband. So, in this way, all the able young men who came to ask for her hand were turned away. As time wore on, her suitors became so few that the King invited eligible princes outside his kingdom to come. He did not realize his daughter had resolved never to choose any man for a husband. The last suitor came on her 17th birthday. **Now Princess Arlet is named Flavia. The name is an Ancient Roman name, which does, indeed mean “blonde” (from the Latin word “flavus,” meaning “golden, blonde). You can tell by comparing this Snippet to the last one that these are woefully out of order. This entry was posted in Jasmine & Role Playing Games, The Creative Process and tagged Arbethe, Flavia de UR, Jasmine, King Aranbrod, King of UR, The Story of Jasmine on February 12, 2018 by Darlene.